The struggle of the Soviet people against the Nazi occupiers was a long four years. In 1945, it was clear that the victorious end was not far off. By that time, the territory of the Soviet Union had already been completely liberated from Hitler’s troops, but the Red Army could not stop at that. Those who knew the horror and hardships of the war and saw all the misfortunes that the enemy brought to them, the Soviet soldiers could not stop only on the liberation of their lands. Everyone understood perfectly well: it is necessary to beat the enemy further, not to surrender while at least one Nazi reptile defends itself. Because the battles continued and continued. The Allies finally decided to help the Soviet Union. In 1944, the Second Front was opened by landing in Normandy. The already exhausted by the war the Germans began to retreat farther and farther. Gradually, the defeat and collapse of the Third Reich became a matter of the coming weeks. In the end, under the onslaught of the Allied forces, Nazi Germany finally and irrevocably admitted the fact of its surrender. This event was officially documented on May 9, 1945. This date became the top chronological frame of the Great Patriotic War. However, the Second World War continued. The ally of Nazi Germany in the east was still strong – the militaristic Japanese empire. The forces of the Red Army were thrown into battle with this enemy. The Japanese finally surrendered on September 2, 1945. At this event and ended World War II. Now the whole world could breathe with relief. These two joyful events were reflected in one of the most famous posters dedicated to the victory in the war – the work “We won!” By artist V. Ivanov. It depicts a joyful Red Army soldier holding a red banner with the dates of the surrender of Germany and Japan. The poster also expresses gratitude to the allied countries in the fight against enemies, their flags are depicted below. 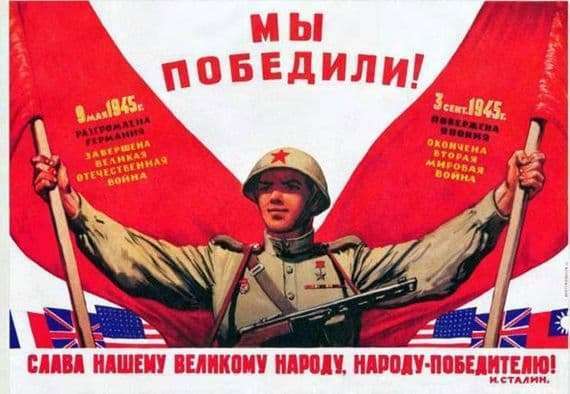 But the main hero of the war is the poster showing the Soviet people, whose feat both at the front and in the rear became the guarantee of the great Victory.